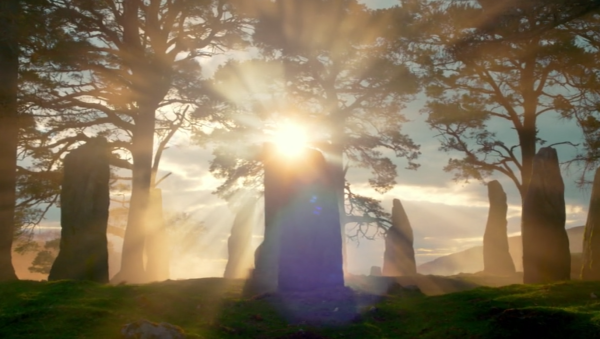 Sweatpants & TV | Outlander, Season 2, Episode 13 - "Dragonfly in Amber"
Welcome to our recap of the season 2 finale of Outlander! This episode was chock-full of flashbacks and flash-forwards, so hang on to your hats. We open in 1968 Inverness. Roger Wakefield has returned from Oxford to preside over his father – the Reverend Wakefield’s – funeral. As he gives a heartbroken toast on the Rev’s behalf, Claire is standing in the back. She is stunning in a long sixties bob, streaked with grey. Roger notices Brianna from across the room and is obviously, awkwardly smitten with her. 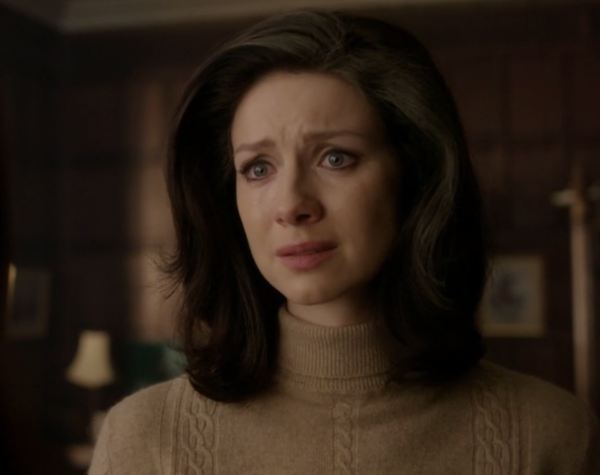 Claire reminds him who she is – Roger hasn’t seen her since he was a boy of seven or eight. The Randall women arrive at the wake. Claire is now a surgeon in Boston. Brianna is a history major at Harvard. Roger is a History professor at Oxford. The Reverend’s longtime housemaid Mrs. Graham is dead, and her granddaughter Fiona now runs the manse. Roger is disappointed that Claire and Brianna have only come for the day; he was eager to show Brianna around. As Claire looks around at the Reverend’s belongings, remembering, Roger invites the two of them to stay. They readily agree. Roger is heartbroken over his father’s death. 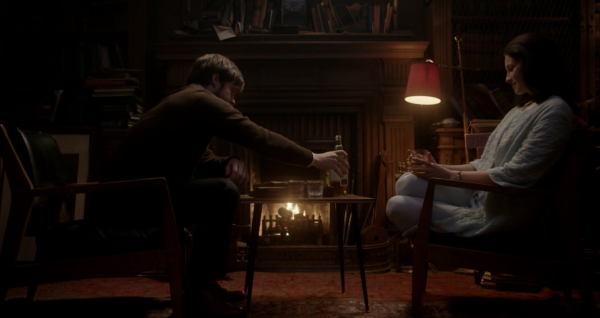 That night, Claire can’t sleep, and has a companionable wee dram by the fire with Roger. The Reverend has a ton of clutter that Roger now has to deal with. He’s going to donate most things, but not the Culloden items, which were the Reverend’s favorites. Roger mentions that his ancestors fought and died there – his true name is Roger MacKenzie, not Wakefield. The Reverend adopted him after his parents were killed in WW2. “I used to know quite a few MacKenzies, once upon a time,” Claire muses. 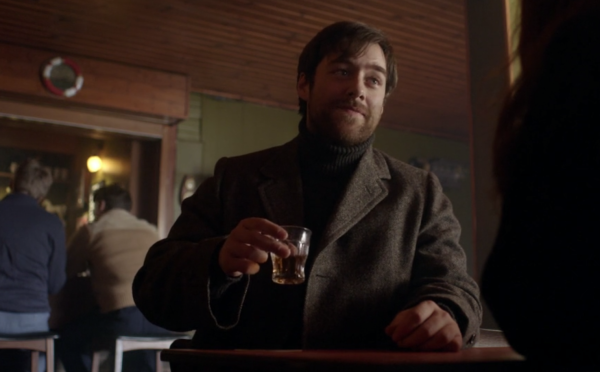 Roger and Claire share a wee dram. We flash back now to the day of the Battle of Culloden, 7:23 A.M. Jamie is literally begging the prince not to go through with the fight. The Prince just smiles creepily and calls Jamie a Doubting Thomas. Jamie storms to Claire, angry. “The battle of Culloden will happen, today. 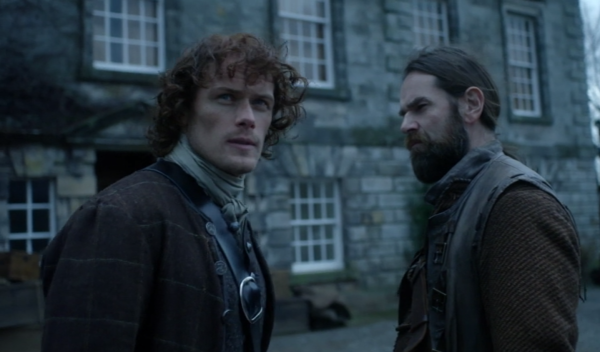 Just as history foretold.” Murtagh interrupts, warning that he’s just heard that the British army is very close. Claire says that they may have one last possibility, and pulls Jamie indoors to speak with him privately. The Prince won’t be dissuaded. Back in 1968, Roger and Brianna are seeing the sights. They’re at Fort William, where Jamie was once badly flogged by Black Jack Randall. As if she can feel the spirit of her true father, Brianna gets a bad feeling. She asks Roger if he remembers Frank. He says sure, bits and pieces. Roger remarks that Frank seemed kind, and so does Claire. Brianna retorts that Claire lives in a another world. 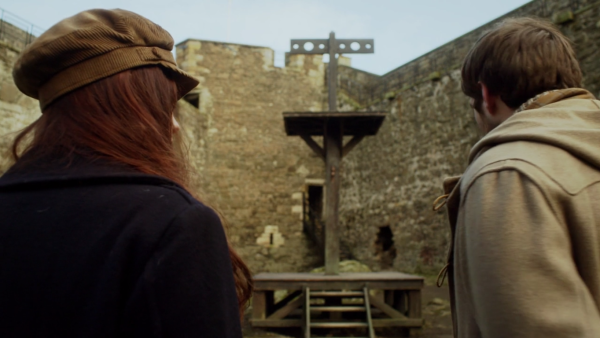 Brianna and Roger take in the gallows at Fort William. Meanwhile, Claire has driven herself to Lallybroch. We hear flashback voiceovers of all of Claire’s memories there – Jamie, Jenny, Ian and their children. What was once a such a happy place for Claire lies abandoned and in ruins. She sits on the steps, mourning. She envisions Jamie, and hears his voice in her mind. You can see her broken heart in her eyes. 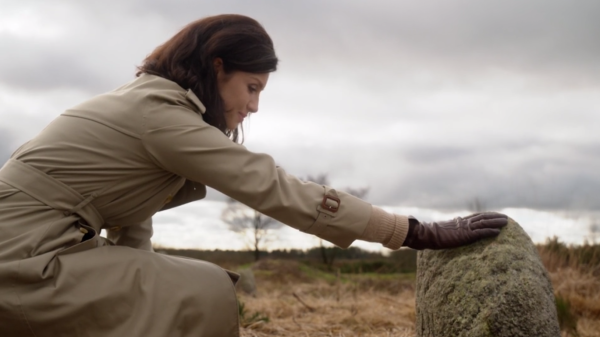 Claire visits her old home at Lallybroch. Visions of Jamie haunt Claire. 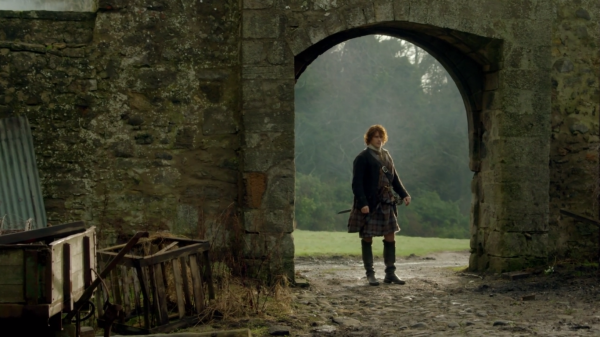 Back at Culloden House, 7:36 A.M. Claire wants to poison the Prince. “What if he were to die, now. Right now. Then the battle would never happen, and this whole bloody rebellion would die with him!” Jamie is not thrilled with the idea of cold-blooded murder. Claire has yellow jasmine, and lets it slip that it’s what she gave Colum the previous night. Jamie is horrified. “He begged me.” She says she can put it in Charles’ tea, right now. Jamie is shocked as hell. Jamie hates Claire’s plan, as usual. 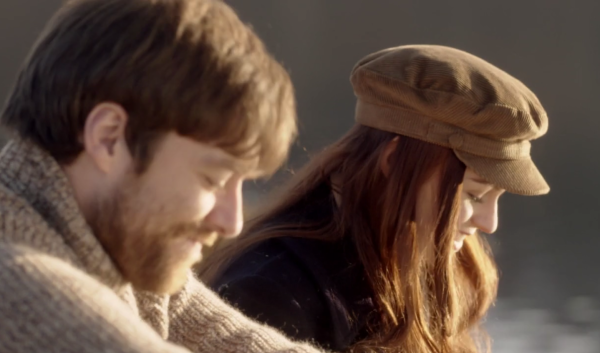 Continuing their date, Roger and Brianna are picnicking at Loch Ness. Brianna asks about an “incident” that happened between her parents when they were in Scotland the last time. She doesn’t know what it might have been. Roger doesn’t remember many details – he was a little boy. He recalls Mrs. Graham crying in the tool shed, and saying that Frank had lost his temper and smashed everything up. “It must have been 1947 or ’48.” Brianna is shocked. She says she once found a lock box that was Frank’s, and opened it secretly. There were letters from the Reverend – mostly academic – but one where he mentioned an “incident” – maybe something terrible. The letter didn’t spell it out. It scared Brianna, and she never mentioned it to anyone. Roger tells her that his father kept a journal every single night of his life, and that perhaps he wrote something about it. The two agree to poke through Reverend Wakefield’s garage. How adorable are Roger and Brianna? 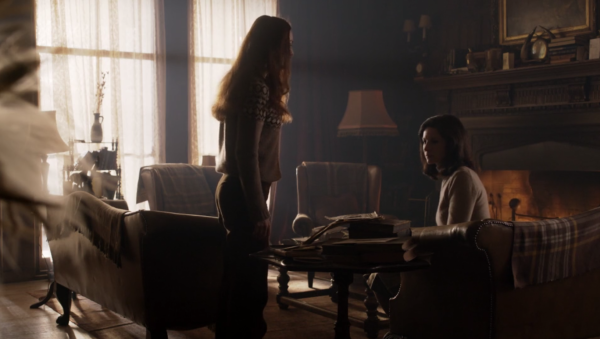 Brianna pushes Claire about her feelings for Frank. Back in 1968, Roger takes Brianna to Oxford. He has an appointment, so she wanders around, running into none other than Geillis Duncan giving a speech about highland culture. She’s the head of a nationalist movement – The White Roses of Scotland – who want to restore it. In this time, she’s Gillian Edgars. Bree listens with interest. Gillian talks of Culloden, and how BPC was beloved. It’s gag-inducing. 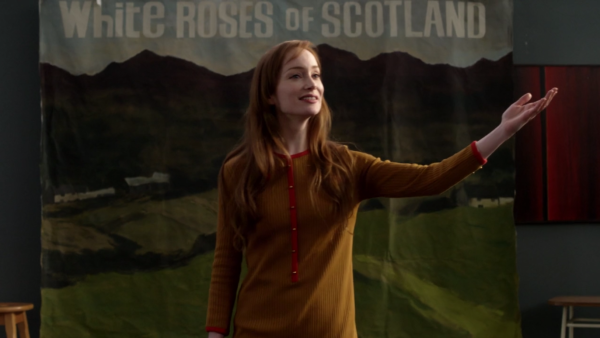 Bree and Roger introduce themselves afterwards, and Gillian hands them a flyer, inviting them to a big rally later. Geillis speaks to her nationalist group. 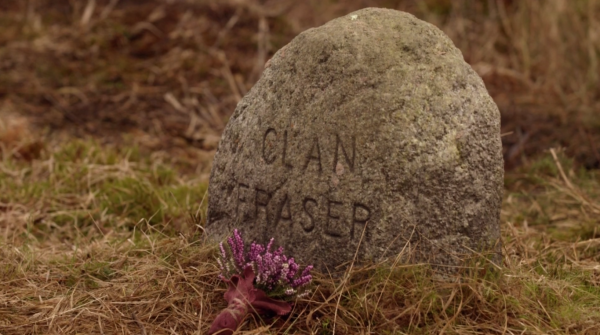 The mass grave of Clan Fraser. Roger and Brianna go through the Reverend’s things, and find a box marked “Randall.” There’s a letter from Frank, saying not to research BJR any more – “He’s not the man I thought.” Bree and Roger find the old press clippings from Claire’s disappearance. “Kidnapped by the fairies?” Bree wonders aloud. Says Roger, “I think you’ve found your incident.” Roger questions whether or not Brianna really wants to find the truth. She says that she does. 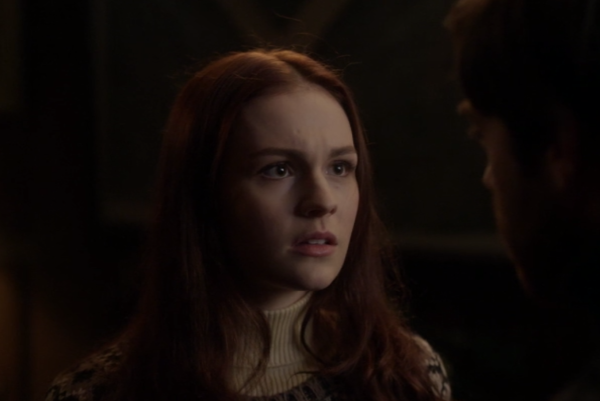 Bree confronts Claire to tell her the truth of what she’s really been doing for the past few days. She’s done the math, and thinks Claire has been seeing a past lover – Brianna’s real father – rather than puttering around town as she claimed. Claire is taken aback. “It’s complicated.” Bree is furious. “You were three months pregnant when “the fairies” brought you back to daddy!” Roger comes in, and Brianna insists that he stay and hear Claire’s explanation. 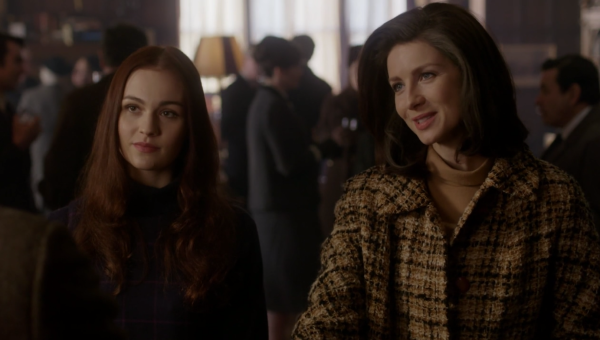 Claire explains that it’s true that she loved another man – Bree’s father – and that Frank didn’t want Brianna to know about him. She explains their agreement, and that it was why they moved to America. 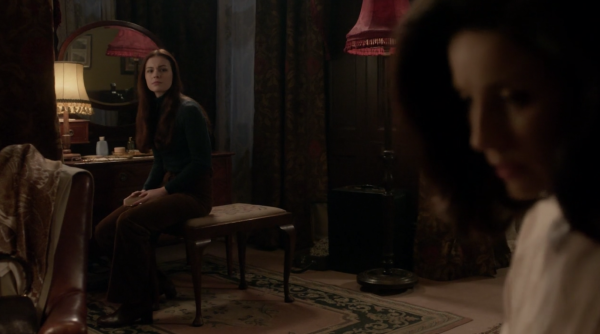 Brianna questions their presence in Scotland, and wonders if Claire expects her to meet her father, now. 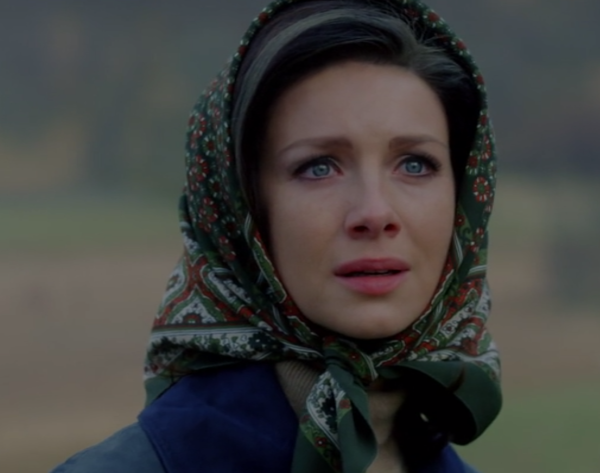 Claire explains that he’s dead, but that she’d like to tell Brianna about him, now that Frank’s dead and she doesn’t have to honor her promise any more. Brianna doesn’t want to know anything about him. She moves to leave and Roger points out that she wanted the truth and this is it, so she should take a seat. She does. Claire continues. “Jamie loved you very much, even though he never met you. He loved you with all his heart. And he would have raised you, if it wasn’t for the Battle of Culloden.” Say what? Culloden, 8:34 A.M. Jamie and Claire confess to Murtagh that they’ve killed Dougal. 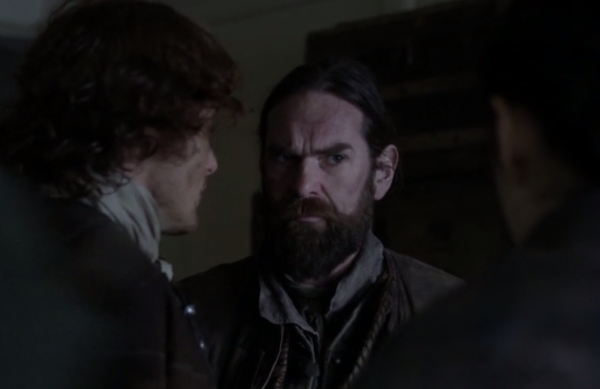 Murtagh remarks that he’s only surprised that it took Jamie so long. 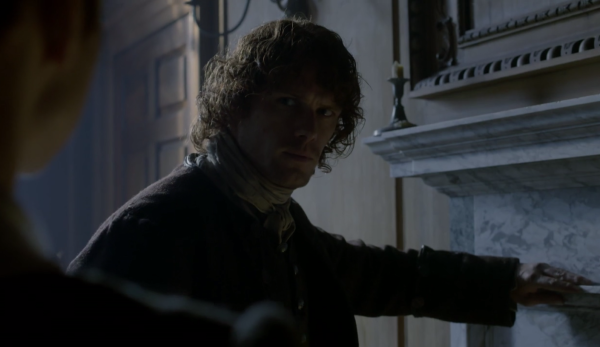 “What’s to do, then?” Jamie puts the deed together that leaves Lallybroch to young Jamie. It protects the estate and keeps it in the family. He backdates it by a year. “Before I was a traitor.” They all sign. You have to get up pretty early in the morning to surprise Murtagh. Claire pleads with Brianna to understand. Back at Culloden, 8:37 A.M. Jamie sends Fergus to deliver the deed to Jenny at Lallybroch. 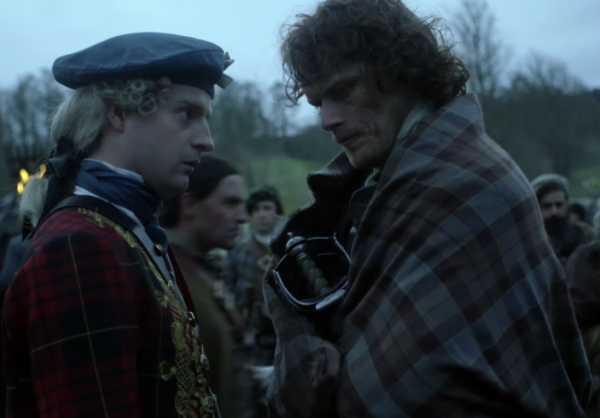 “It is worth more than my life, or yours.” Fergus doesn’t want to leave them, but Jamie convinces him. He and Claire tell him that they love him like their own son. 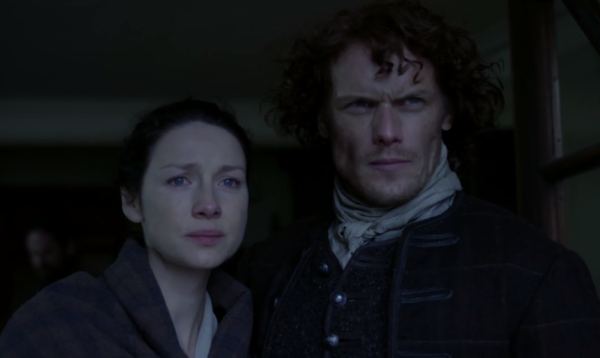 Claire and Jamie say goodbye to Fergus for what both believe will be the last time. Back in 1968, Roger and Brianna have taken up residence in a pub, where Roger is telling Bree to have a little imagination about her mother. Brianna won’t have it. “She’s insane.” “You said you could never get close to your mother; that she lived in another world. Maybe she’s trying to show you that world.” Brianna asks if he believes. Roger says it’s only important that Claire believes it. “Maybe we should keep an open mind.” “How about we keep an open tab, instead?” Brianna replies. Roger is imaginative, especially over a glass of whiskey. 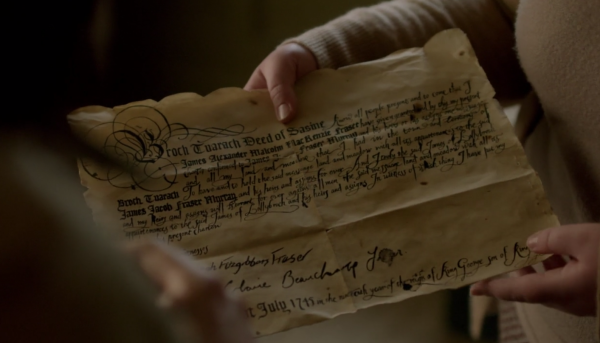 At the manse, Claire finds the flyer that Geillis gave to Brianna. Claire remembers that Geillis travels back in 1968, so she’s here, right now! She drives to her house to try to convince her not to go, or at least warn her about the witch trial, but only finds Geillis’ drunk husband, Greg. Geillis left him weeks ago. As he passes out, Claire swipes a few of Geillis’ notebooks – one is about going through the stones. Back at the pub, Geillis shows up and chastises Roger and Brianna for missing the rally. “Maybe we’ll catch the next one.” Geillis reveals that she’s leaving town tonight to “further the cause.” She wishes them well and leaves. 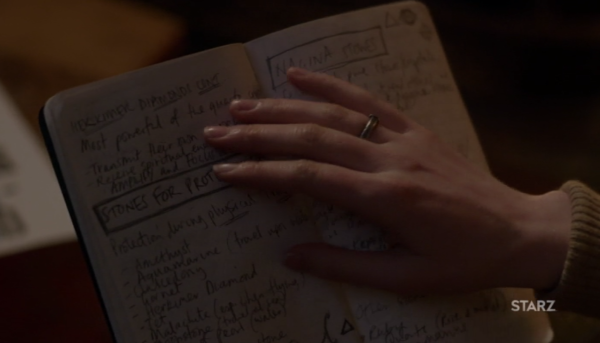 Meanwhile, Claire is reading Geillis’ notebooks. She had studied and prepared for time travel. Geillis believes there must be a human sacrifice to make it possible and gemstones to guide and protect you. Claire figures out she’s leaving soon, but doesn’t know when. Back at Culloden, Jamie instructs Murtagh to rally the Lallybroch men and lead them on the path to safety, back towards home. In the confusion, nobody will notice they’re missing. “We’ve done all we can, and now it’s over. I’ll not have my kin die for nothing.” Murtagh agrees, hesitantly, then asks Jamie what he’s going to do. He says he’ll take Claire to safety, then turn back and fight and die on Culloden moor. Murtagh says that he’ll guide the men to safety. “But ken this. When ye return, I’ll be waiting here to fight by your side.” Jamie says no. “I won’t have you dying for nothing.” “I won’t be,” says Murtagh. “I’ll be dying with you.” I may or may not have ugly cried at that part. Jamie and Murtagh sort out the plans. Later, Claire knocks on Roger’s door, asking if he knows Gillian Edgars, and where she is now. He mentions that they just ran into her, down at the pub – and she’s leaving town tonight. Claire says that she’s got to stop Geillis from going through the stones. Brianna yells at her to stop making things up, and Claire says that Geillis is the one from the witch trials who saved her life, and now Claire means to return the favor, if she can. She stops short as she has an ugly realization: “Except I can’t. Because of you,” she says to Roger. 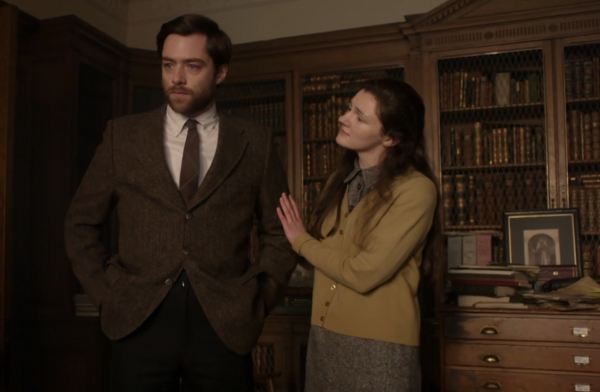 Claire explains that she looked up Roger’s genealogy, and that he’s the descendant of Dougal and Geillis’ baby. “So, you’re saying that my ancestors are the war chief that you spoke of, and the witch?” Bree is furious, but Roger is kind of into it. “If all this is true, then we have to stop her, don’t we?” Roger is gentle and cool about it, which makes Brianna even more furious. “Roger, you’re feeding her delusions!” She storms out and Roger grabs her privately, explaining that there’s no harm. If it’s not true, maybe they can make Claire face her delusions. And if it is? Well. Brianna reluctantly agrees. Roger gets Brianna on board. Back at Culloden, Claire and Jamie beat a hasty retreat. Claire doesn’t know where he’s taking her. As all the men run towards the moor, they’re heading the opposite direction. She pleads with him to escape with her. He refuses, saying he’s a dead man already. She says she’ll die with him. He refuses. Claire argues. “At the witch trials, would you have left me?” “I would have gone to the stake with you! But I wasn’t carrying your child!” Claire is shocked that he knows. She’s not very pregnant. “It’s too soon!” He replies that he knows her courses; has been keeping track. In the middle of a war. “This child is all that will be left of me, ever.” They have a tearful argument, both begging the other. He reminds her that she promised she’d go back to Frank, should the need arise. He drags her onto a horse. 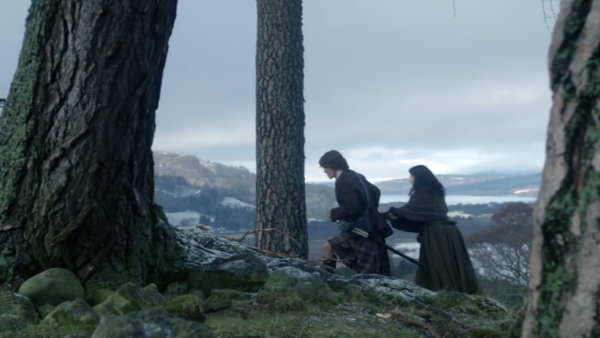 Jamie whisks Claire to safety. Back in 1968, Claire, Brianna, and Roger race to Craigh Na Dun, and they spy Geillis’ husband’s car at the base. She took her human sacrifice seriously and is barbecuing poor Greg. The three race up the hill to stop her and they’re too late – they’ve arrived just in time to see Geillis disappear into the stone. Brianna and Roger can hear the buzzing of the stones that Claire always hears. Roger leaves to summon the police on behalf of poor Mr. Edgars. 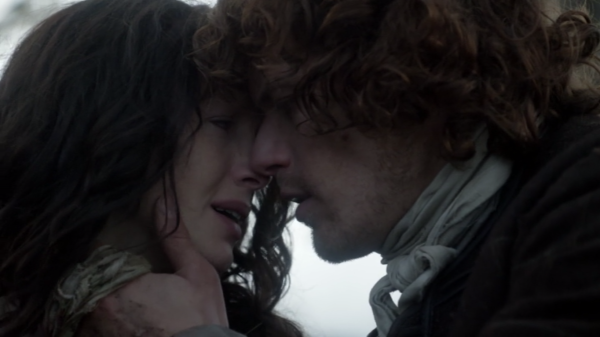 Claire and Jamie’s tearful goodbye. 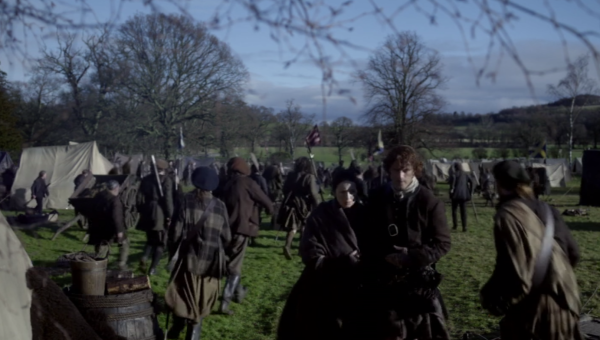 Jamie leads Claire to safety. Brianna being a history major at Harvard in 1968 is an anachronism – Harvard did not become coed until 1977. I enjoyed the use of contemporary music throughout the episode; particularly “The Time Has Come Today”, by the Chambers Brothers, over the final credits. Claire’s pink horn-rimmed driving glasses that she was using in 1968 were excellent. Roger’s impromptu “rat satire” was charming. Geillis surely returned home to retrieve her husband for the barbecue, so she must have noticed that someone (Claire) had stolen her notes on time travel. I wonder if she missed them. God, Jamie was swoon-worthy in this episode. I couldn’t have left him! Heughan and Balfe really sell true love. See you next season! I can’t wait.